Living in the Emirates, we have an ample variety (about 400!) 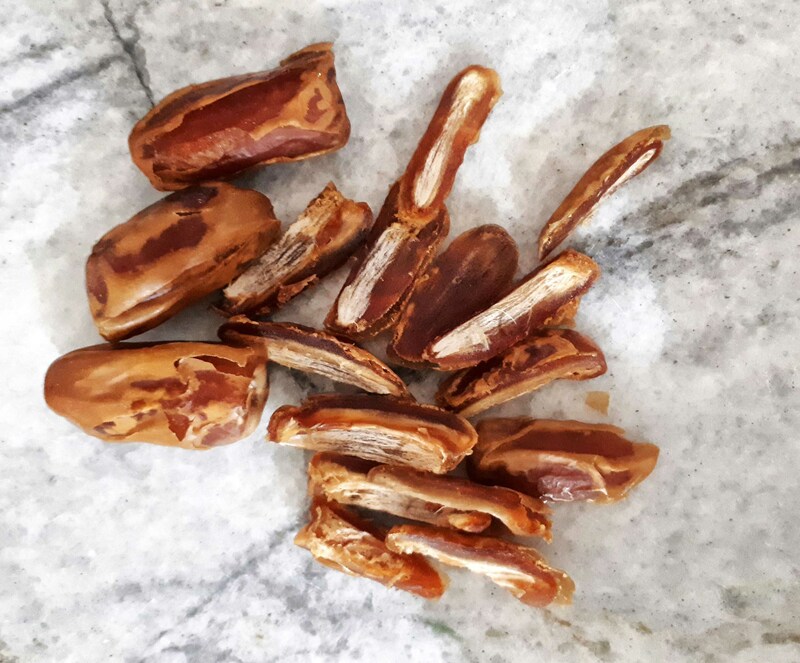 and supply of Dates, the regional fruit. Culturally, dates have long played a vital role in the Middle East cuisine and rituals, surrounding hospitality. They’re prevalent during Ramadan, when they’re usually given as gifts or eaten to break the fast. We’ll be doing our Date Ginger Black Tea cold brew style. Actually, we’ve done 2 versions, the 1st on requires cooking the dates with water over a period of time, then strain and add the black loose-leaf tea. Taste wise, it was quite sweeter and pulpy, even after several filtrations. However, this cold brew method is incredibly simple and yields a very balanced, elegant flavor. No bitterness. Just combine the loose-leaf tea, water, dates, and ginger and infuse overnight. Mix all the ingredients together in a Pitcher, French press or Teapot. Cover and refrigerate overnight. We recommend tasting the tea on the 6th hour and adjust to your liking. We removed the loose-leaf Black Tea around this time and continued steeping the dates and ginger. Once your preferred time has been reached, strain all the ingredients out of the pitcher and pour through a fine mesh sieve. For this tea, we strained 2x to remove the fibrous pulp. Add a sweetener as an option to your liking. Serve and garnish with orange wedges, fresh ginger and or mint. We find that the ginger overall gives a nice contrast to the sweetness, as well as the orange wedges. For the pulp, do not discard. We recommend using the date pulp as jams, preserves or chutney. We’ve created a Date Blueberry and Chili chutney and paired it with Cheese, and it was divine! Happy to share that recipe if anyone is interested. If you do make this, let us see ☺ Tag your photo and share with #yvetteteas on Instagram. Join our journey as we launch yv et te´ soon. Our Stories cover mostly Tips, Tutorials & Tea Travels. No heavy writing here, only inspiring Tea Experiences! © 2017 Asia Innamorata · Website built by F.P.